Moving over 1324 miles away from her home in China, MA Fine Art Digital student Huijun Guan came to London to find work and further her creative practice. In this post Huijun tells us about her experience as an international postgraduate student and the work she will be exhibiting in this years MA Visual Arts Show 2015. ‘I have always wanted to live in London and after graduating from my BA New Media Design course in Shanghai I moved over to England. Finding a job however was a lot harder than I had anticipated. I began work in a customer service role but soon realised that what I truly wanted to do was to create my own artwork and curate exhibitions for museums or galleries. After lots of applications, I began an internship at the Saatchi Gallery and shortly after I began my studies on the MA Fine Art Digital course here at Camberwell. On my undergraduate course in China our tutors always told us what we should do. The course covered a lot of areas including animation, photography, interactive and media design however we were always given set tasks we had to complete. In some ways this was great as I learnt a lot of software but when I came here I found that I could explore any idea, concept or process that I wanted to. Jonathan Kearney (MA Fine Art Digital Course Leader) is a really good tutor and he told us that we can do anything; as a result the work from the course is really diverse. When I started the course I came up with lots of different ideas that I wanted to do but Jonathan has helped me focus, teaching me how to improve and refine a concept. Alongside Jonathan, we also have a tutor who assists us with software and digital programmes that we may need to learn. All the tutors are great, as well as asking questions about my work I can also ask about job seeking or creative opportunities. 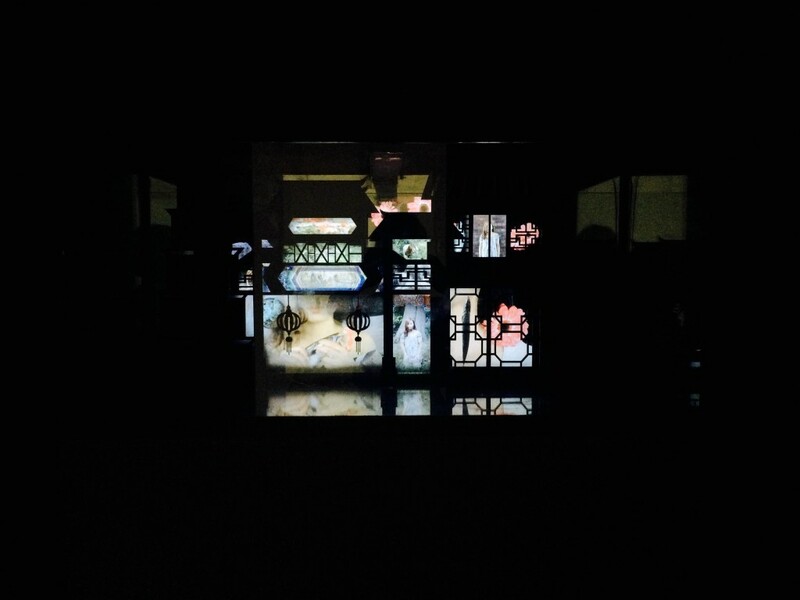 For the show I have created an interactive installation piece based on a traditional Chinese story. I have installed a fish tank which holds real fish in water, behind this is a laser cut scenic backdrop and a monitor displaying a video piece. In China there is the belief that women are made of water and men are made of mud. I wanted to question these beliefs as they imply women are of a weaker nature when in fact we are equal. The fish in my work represent a trapped girl, we think they are free but they are trapped by the water. It is my belief that we are all trapped in some way, by circumstance, by the earth, by the universe. 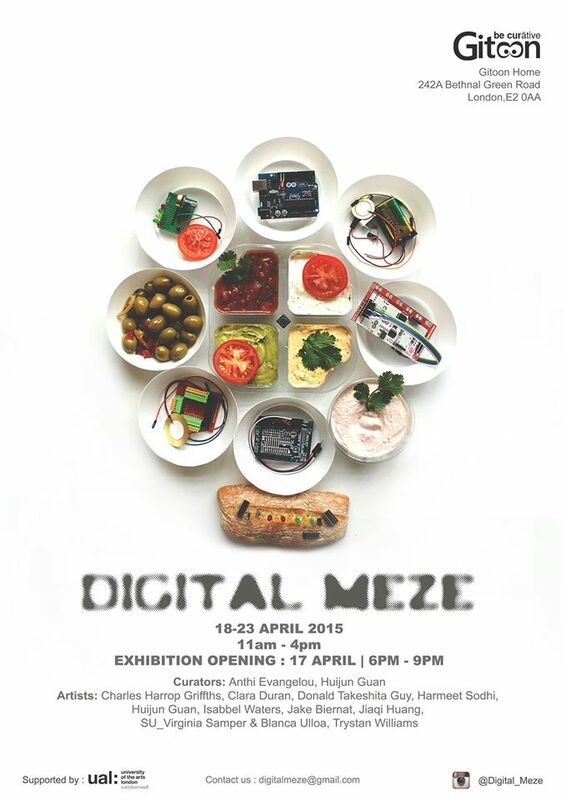 In order to build on my interests in curating, earlier this year I organised an exhibition of work from MA Fine Digital Art students – ‘Digital Mezze’. I found that for many students on the course, finding an affordable exhibition space was difficult. I decided I would find a space and curate a show for everyone. After seeing a call for entries online I got in contact with a gallery owner and arranged a visit for him to see my work. Through my internship at the Saatchi Gallery, and connections I had made at UAL I was able to help him promote his gallery and he offered us an exhibition space for free. I asked a few other students to come and have a look at the space with me. In the beginning it was difficult as the space had recently been used as an office and had desks in it. I was determined to make the show happen and so I helped the owner sell all the furniture. Fellow student Anthie Evangelou helped me to organise the show. It was difficult as in China I knew where to get prints and posters made cheaply but here I needed to research into this and it is more expensive. We promoted the show on websites and through the university, across social media and using posters which we put up at the college. In total, there were 10 artists involved across first and second year of the course. The exhibition went really well and the Private View that we held was well attended – it was also the same day as my birthday which was a lot of fun. Through studying on the course I have also been involved with the Lumen Prize. The prize is an exhibition which celebrates digital work created by artists and this year we helped curate the show. I also met Carla Rapoport the prize Founder, and in a conversation with her we discussed why the show had been exhibited in many international cities however never in mainland China. Carla explained the difficulties she had experienced applying for visas and managing the budget in Shanghai. Using my knowledge of the city I helped her to find a gallery that can be used and will be helping co-ordinate the prize’s first exhibition in Shanghai next year. The gallery we are using focuses on traditional Chinese painting so it will be interesting to curate a digital art exhibition in this space. The MA Visual Arts Summer Show 2015 will be open at Camberwell between Thursday 16th – Wednesday 22nd July 2015. The Private View (all welcome) will take place on Thursday 16th July between 6-9pm.